DISTINCTIONS: Mound shaped shrub with fine-textured appearance; small oval glossy leaves turning red in the autumn; small yellow flowers producing oval red berries in the fall that persist through winter; grows in full sun and tolerates partial shade. LIMITATIONS: Thorny; poor leaf coloring in the shade. CULTIVARS: var. atropurpurea ‘Bagatelle’ slow growing compact shrub forming 2’ mound; purple red leaves throughout summer. ; var. 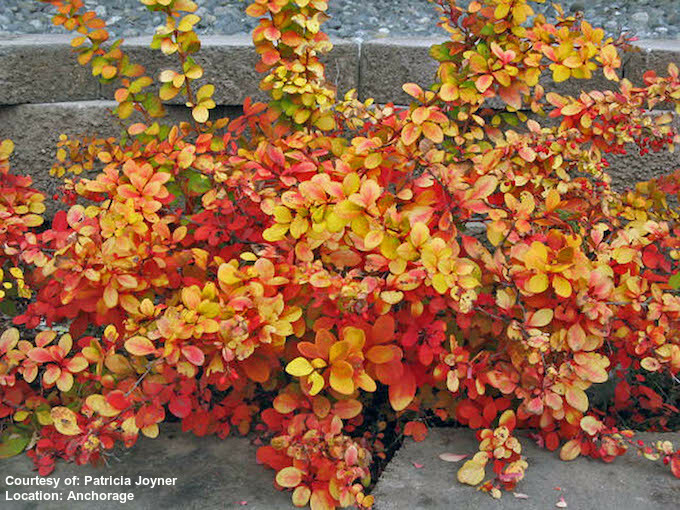 atropurpurea ‘Crimson Pygmy’ compact shrub forming 18” high and 3’ wide mound; purple red leaves throughout summer. ; var. atropurpurea ‘Rose Glow’ shrub to 5’ tall; purple leaf buds opening to purple with pink mottling; good red autumn color. ; ‘Aurea’ golden yellow foliage; 3’ tall. ; ‘Kobold’ bright green foliage; 2’ tall. ; ‘Sparkle’ arched horizontal branching; 3’ tall; glossy dark leaves turning bright orange and red in autumn.